Walls fish house circa 1968. Photo courtesy of Cynthia Lawry. 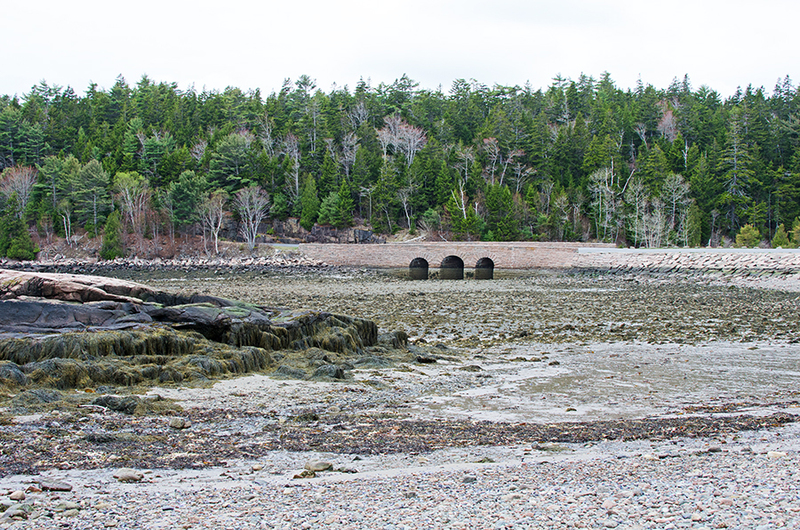 May 11, 2015: 10am-noon, low tide at 11. 57ºF, overcast, chilly, some wind. 1 Wild Turkey (Meleagris gallopavo), several Herring Gulls, 3 bicyclists, 1 Eider, 2 black duck-like birds far off in the distance (probably Black Scoters), 2 Laughing Gulls (Leucophaeus atricilla), 1 Downy Woodpecker. Throughout her childhood, Cynthia spent summers in Otter Creek with her great-grandparents, Chester and Myrtle Walls. She lives in Gloucester, Massachusetts now, and we met at the Fabbri Memorial on a damp, cold, grey day in May to talk about the family fish house and her memories of growing up here. 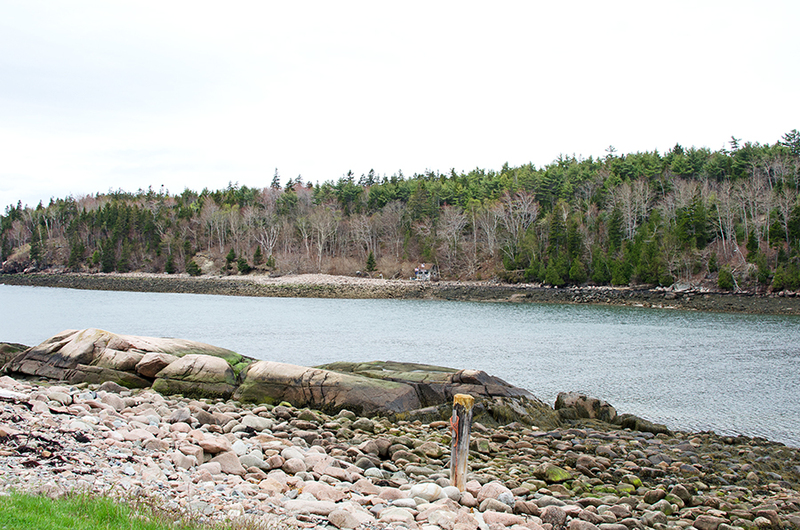 Looking out across the cove, Cynthia pointed to the existing fish house. 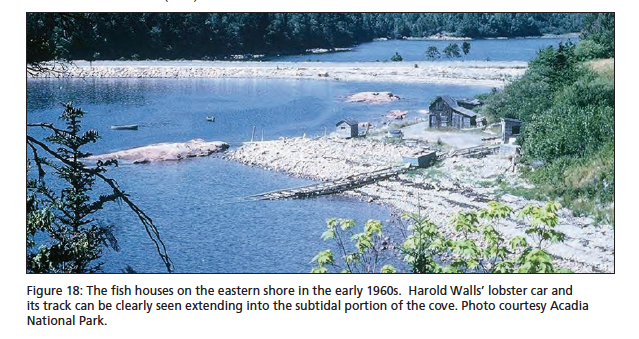 Cynthia: That fish shack was not there [on the opposite side of the cove] when I was growing up. We had the fish shack over here [on the east side of the cove], and then the National Park came in, there’s a lot of crazy stuff, and that was torn down, and then all of a sudden the Smiths built that. Fish house on the west side of the cove: built by Steve Smith in 1976, burned and rebuilt in 1983, now owned by the Otter Creek Aid Society. Jenn (me): And roughly when was this, the ’70s? C: Yeah. 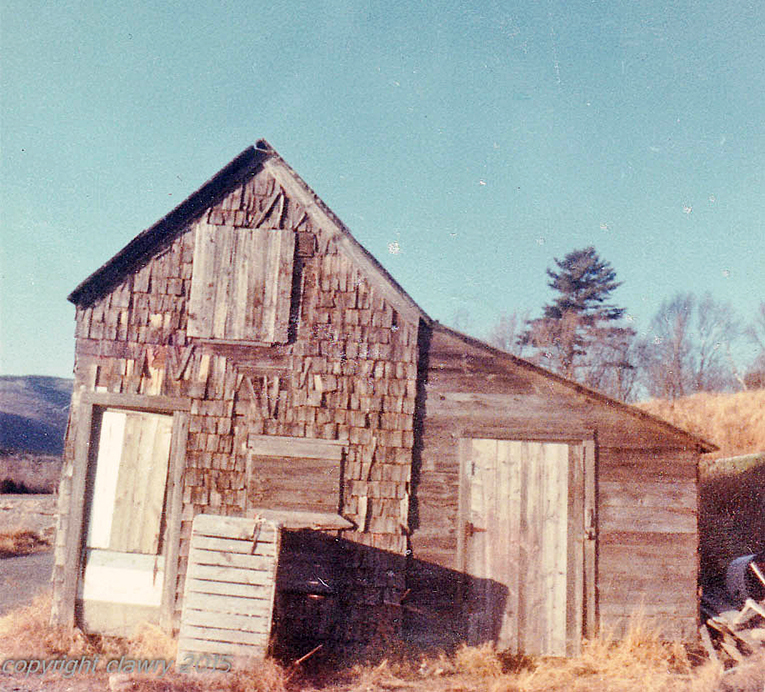 I think this [the Walls fish house] was torn down early ’70s. And then that appeared. 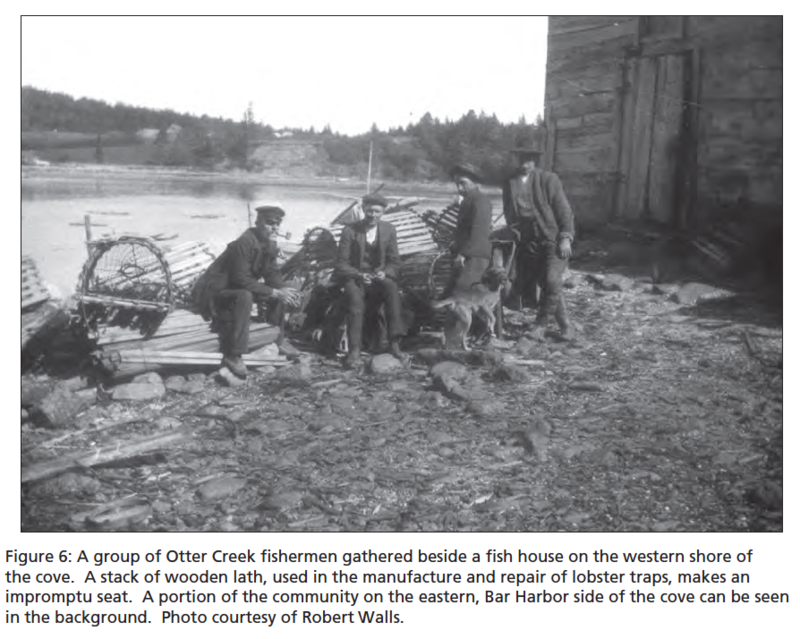 …My great-grandfather, Chester, had a forty foot lobster boat in here, and he would haul it right there, in front of that big rock, and do his repairs. One of my earliest memories is him taking me out and handing me a boat hook, and us being off the Point, and him saying “Fend us off the rocks!” And I was, you know, this big [holding her hand at about waist height] I was very tiny, I couldn’t even really lift the boat hook, and thinking, “We’re going to die if I don’t do this.” He was a really wonderful man, he was deaf by the time he was 14, I guess he worked in a lot of engine rooms, and they’re very loud, and he was really deaf. You had to really scream to get him to hear you, but very kind. I think his deafness kind of separated him a little bit from the world. I grew up listening to he and his half-brother [Harold]; Chester’s mother died at some point, his father’s name was Willis, and Willis married another woman and had Harold. So Harold was a lot younger. They both shared the shack that was down here, and they had two slips. Let’s go wander over there! 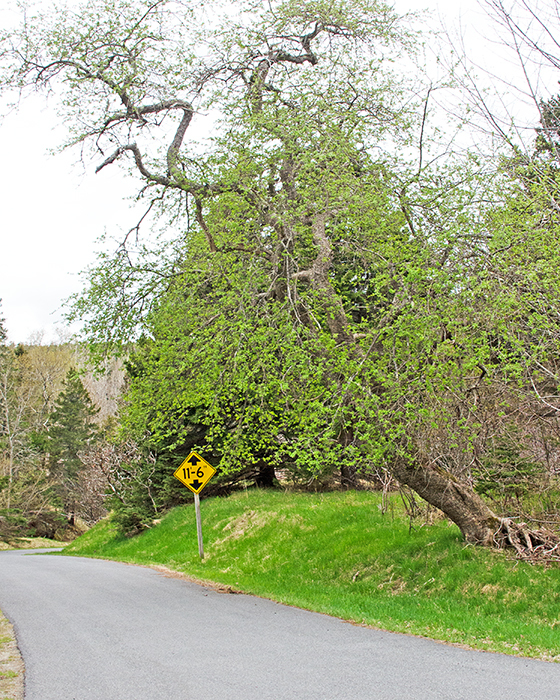 C: So this is the old road that goes down in [ed.note: not marked but called the Fish House Road or Fishermens Lane]… there’s a crabapple tree that my grandfather planted that’s still there. J: So how long did you live here? C: I had a grandmother who lived in Newton, and it was felt when I was about 6 that it would be best if I lived there. I spent every summer here, and I learned how to lobster from my great-grandfather, and set trawl. These are where the boat slips were. This one, where the memorial piling is, for my Uncle Harold, that was his boat slip. 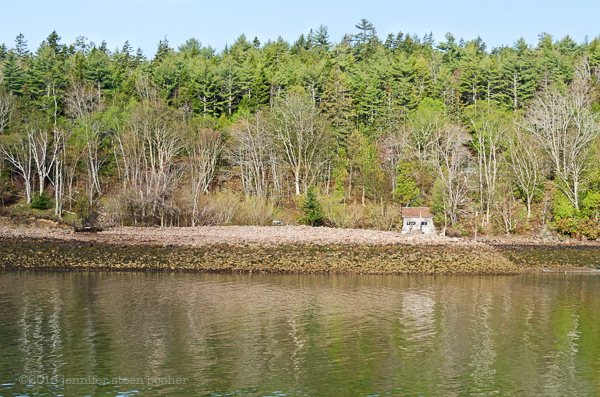 Photo from Deur, The Waterfront of Otter Creek, 2012. There’s a poem on the other side of it that he wrote. He was self-educated. I think he might’ve gone through the eighth grade, but he read and wrote beautifully. I do have some of his letters, I’ll have to dig them out because they are really spectacular. J: I’d love to see them. 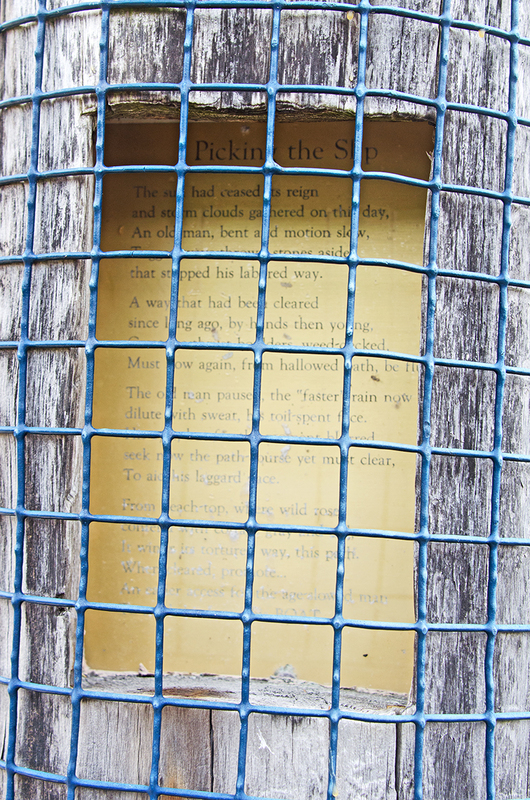 [looking at the other side of the piling, where the poem is set into the wood.] Oh cool! C: His son, Bobby, did this. J: Now is that Bob Walls who manages Mrs. Pyne’s place? C: I think so, I haven’t seen him in years. C: I grew up with them. My great-grandfather lived at what’s now 169 Otter Creek Drive, and they lived across the road and a little bit towards town. My aunt lived in the next house over, my grandmother lived in a house towards Otter Creek. J: So they’re your cousins? C: Yes. …And then Harold’s boat slip was here. They would moor their big boats out in the middle, because at low tide there’s a very small channel to get through. … Harold wrote a poem about ‘picking the slip’ because it was our job to come down here and pick the rocks out of the slip so they could get up in there. As you can see it hasn’t been done for a while. We used to drive an old truck and back a boat in. I don’t know why they settled this area, it seems insane to me because of how inaccessible it is to the water. It’s not an easy place to fish. To get in and out of. J: It looks like it’s wide open, but it sounds like its actually really hard to get in and out. C: I used to be able to take a motorboat in and out of here without killing the propeller, but my father couldn’t. We would go out and set trawls, tub trawls, for halibut, and he’d set off the Sand Beach; from the Soaker in to the Sand Beach is a really good place, or it used to be, and he had my great-grandfather’s chart that he had all marked up and his old gimbal compass, and I don’t know what my visual reference points were, but I could get a boat up, whereas my father ruined more than one propeller. J: So did he grow up here? Looking southwest past the Harold Walls Memorial Piling and the former site of the boat slip to the OCAS fish house. J: No kidding! I can see why, it’s awesome. C: It’s got great tide pools on it. When I would be let loose here a lot of times I’d sit on this rock. J: I’m a sucker for tide pools, you’ve probably noticed that. C: And at high tide you have to swim to get off this rock. It has happened. If you were a little kid and you had to pee, you came up on the rock. Out of sight. This used to be a little more thriving. There was a guy named Shirley Bracy, and he was a clammer and he was a character. He would always come down and they would jaw as they were fixing nets or whatever they were doing, working on the boat. The fish house was right there, and it had two large wooden barrels of lobster bait, and I’m pretty sure that stuff had been in there since the 1700s. J: Kind of like a sourdough starter, you just keep adding to it. C: It was absolutely horrible. J: How did they keep animals out of it? C: It all locked up and shut up … and the barrels both had heavy lids on them, wooden lids. It was a stinky mess! C: When I was a kid we would clam over here towards the road [the muddy area by the causeway] , and since I was under a certain age, I could dig a peck of clams a day without a license. J: Wow, that’s a lot of clams, isn’t it? C: Yep. And I liked fried clams, but my father really like steamed clams, so I would dig and he would eat. But it was fun, it didn’t seem like work. J: Did he ever fry them up for you? C: Once in a while someone would fry them for me but for the most part no, they were always steamed. … I heard that back in the day the mackerel would run in here, and they would sort of net a part of it off and row out … . Once when I was a kid and I think we were out fishing for pollock, and it was really foggy, a lot of times it’s really foggy in Otter Creek and you just go round and in Bar Harbor it’s clear as a bell. It was magical to come down here in the morning and have the fog. Once we got blown off, and I remember my father saying to me, ‘Well, the next stop is Europe.’ If we don’t figure this out, where we are, we’re going to Europe. It was foggy and windy and I thought for sure we were going to Europe. 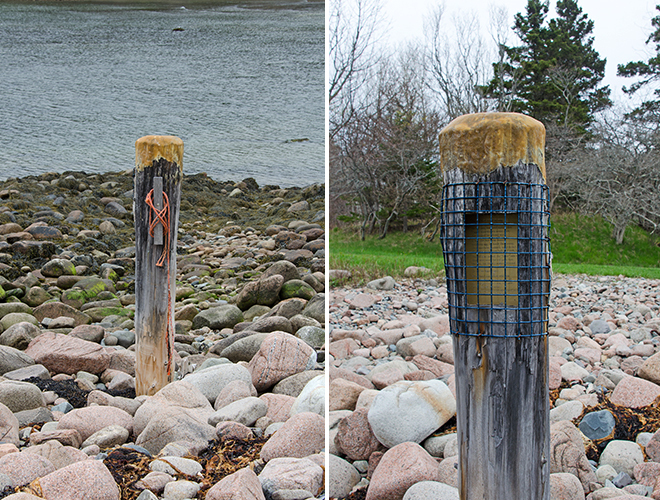 But we saw a lobster buoy and knew we were headed in the right direction. I wonder sometimes, how much was he pulling my leg and how frightened really was he? 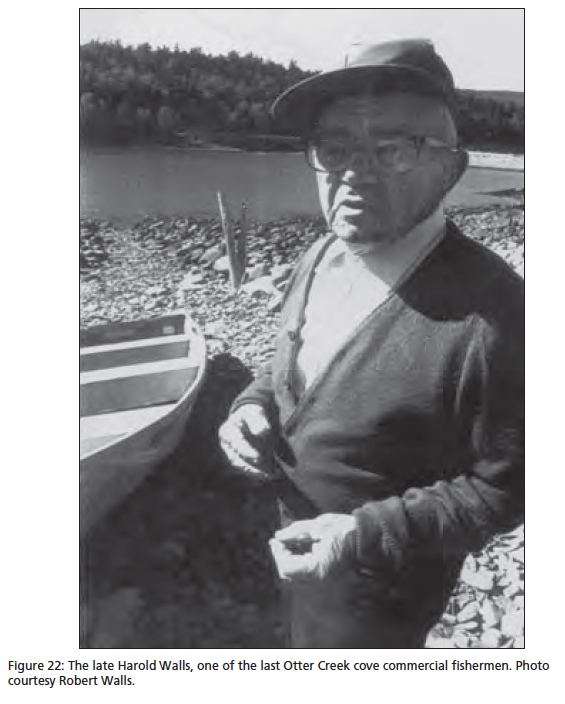 C: …In addition to fishing for flatfish, groundfish, [Chester and Myrtle] farmed, and he had two acres of raspberries, I grew up picking raspberries, we would sell them to Testa’s, they would make raspberry pie. I remember going in and delivering the rasbperries when I was a really little kid, and the whole kitchen was stainless steel. My great grandparents were first cousins, because the wife of Willis was a Davis, and my great grandmother was Myrtle May Davis. Myrtle and Chester Wallace. They had three daughters, they had my grandmother, Ida, and they had Aunt Madeline, and Aunt Clara. Ida is an old family name that goes back in the cemetery way, way back. Anyhow, Ida was a very popular name, and I think it was popular just in that time. J: Kind of like Jennifer now. J: I don’t know if you saw the most recent [post] at Sand Beach, and there was the picture of a little girl, Virginia Higgins – one of my friends was like, ‘oh my god, that’s my great aunt!’ So she’s looking up the family history; Virginia Higgins … was a nurse in the Navy, I think. So she’s looking to find out more about what happened to Virginia and how she ended up in the movie. C: My grandmother used to tell me about the movie. 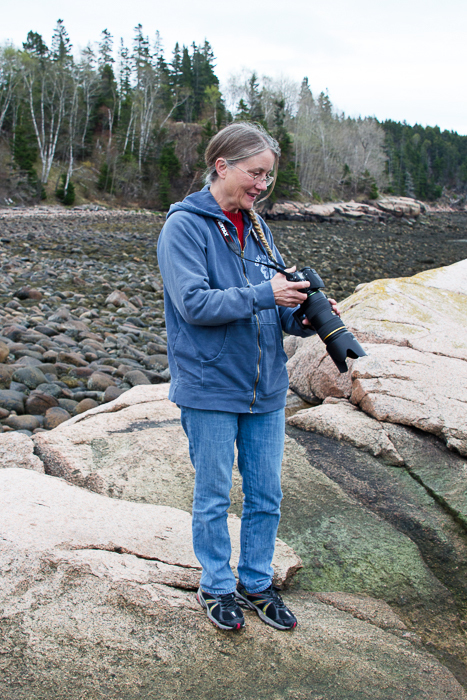 … My grandmother … grew up in town, on Ledgelawn [Avenue in Bar Harbor], other side of the family, [and she] played the piano at the theater for the silent movies, and when I would say ‘We’re going to the Sand Beach,’ when I was a teenager, she would tell me not to go swimming in the water because they used to make movies there and somebody dove off a cliff and was swept out to sea. I don’t know if that’s true, if that really happened. J: There was a cameraman who got washed off; he didn’t dive in, he got hit from behind by a wave. I’m not sure if that was on Schooner Head or on Sand Beach. C: That could’ve been the basis for that little cautionary tale. J: There was definitely a death on one of the movies. Not on the Queen of the Sea, it was on a different one. C: I have boxes of stuff from this side of the family and the in-town side of the family. They were prolific postcard writers. 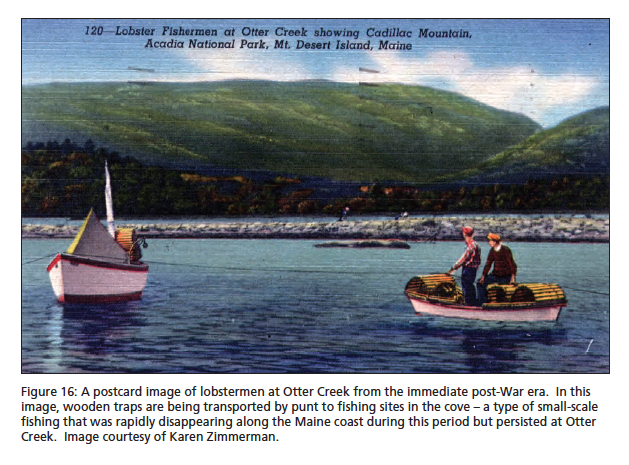 They would write a postcard from Otter Creek to Bar Harbor. Some of them are really nice old Maine postcards, and some of them are stupid, goofy stuff, just sort of humor from the era. And I really want to scan those and catalog them, because my background is, I worked at Cornell University in the archives. I was in the Rare Books and Manuscripts. I have newspapers from when my grandmother graduated from high school, [and] I have really cool stuff like they gave them these little fake torches, and just little artifacts. I’ve got a treasure trove of stuff like that … my great-grandparents, Chester and Myrtle, never threw anything out. They have receipts, they had a stand on the side of the road where they sold green beans and things, they have this all listed, the summer people they sold things to, they kept them in these little notebooks. When I was a kid I would go out and weigh beans and sell them to the summer people. That’s part of how they earned their living, because you couldn’t just do it lobstering. J: Even today there are … few people who have just one job. [A lot of] people do this for a living and then they do that in the summer and that in the winter. C: It pieces together. And here … then in the winter there was nothing. Everything closed. Now most everything closes, but there’s more stuff. J: Well, winter’s when we see each other. Summer, everyone’s too busy to hang out. Winter is … plays and basketball and potlucks. C: We would have picnics on the beach and sand in food. I just remember sand in cucumbers. And clamming, that was a really good place to clam. And I know Shirley Bracy used to clam. He died maybe ten years ago. When I was a kid I thought he was ancient. But he wasn’t. J: When you’re a kid, forty years old looks ancient. C: True. He would come over to Chester’s house at night. Chester had a big garden out back, and he would sit in his rocking chair with his .22, looking for deer. Harold would come over, and usually somebody else, there was a guy named Uncle Pete, and he was bald. I don’t think he’s any relation. He lived in Otter Creek. He had a daughter named Marcie who babysat me … . I just remember they were very nice to me. 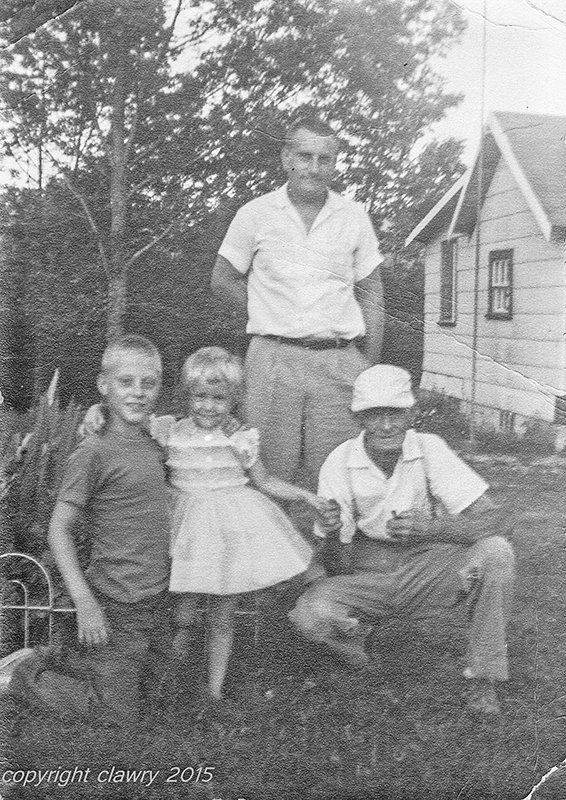 And they would come over and they would just talk over the day, about what fish they caught and things like that, just kind of hang out, and my great-grandfather would be looking for deer to shoot in the garden. He never did, but it was very impressive. J: Was he hopeful that there would be a deer, or was he just trying to keep them away from his garden? C: He was trying to keep them away from his garden. He had a fish shack at the house, too. He kept his tools and stuff. And on the door to that were two bear paws. Back in the day he shot two bear. His family, they settled the island, there were three brothers, I believe [the father was] Andrew Wall, and he died in Lincoln County in 1792, but his three sons came here and settled Otter Creek. Why they picked this place I don’t know, it was a fun place to grow up. We used to get let loose on the road to pick blueberries, I think because my parents wanted to get rid of us for a couple of hours. But it was fun. J: We used to run wild, too. I was out in the woods all day. We’d come home when we got hungry. C: There’s a brook that goes down and comes in over there. It goes up behind my great-grandfather’s house. We would go and catch frogs and let them loose in the house. And we would catch fireflies and let them loose in my mother’s bedroom at night. J: We caught frogs and fireflies but we didn’t put them in the house! C: We just thought that was really cool. … In WWII they had blackout curtains, which were still [in my grandparents’ house] when I was a kid, because of the submarines. 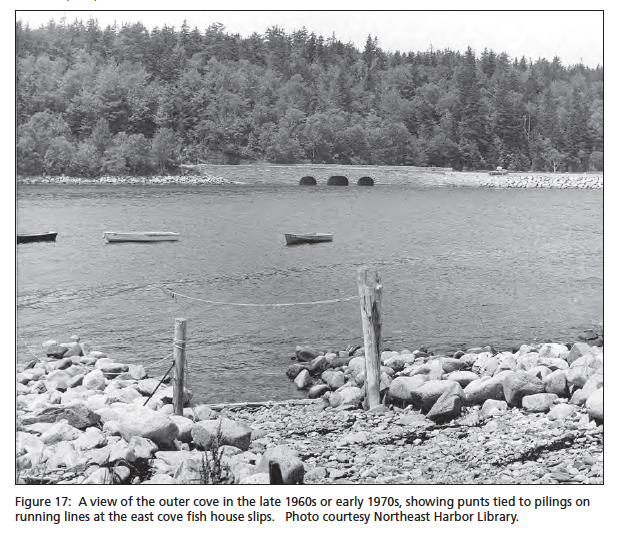 And I guess during WWI there were submarines that did come into Bar Harbor. …The Bar Harbor Club would host tennis tournaments between the British and American soldiers during WWI, and [my grandmother] would go and play for the dances. … My grandmother was born on Ledgelawn; she was the daughter of Benjamin and Priscilla Perry, and they originally came from Addison, Harrington, I think. She was born and grew up with her older sister Catherine, who married into the Hamor clan. Which is how I’m related to the Hamor clan. J: Sounds like you’re related to just about everybody here. C: Walls, Davis, Young, McFarland, Hamor. 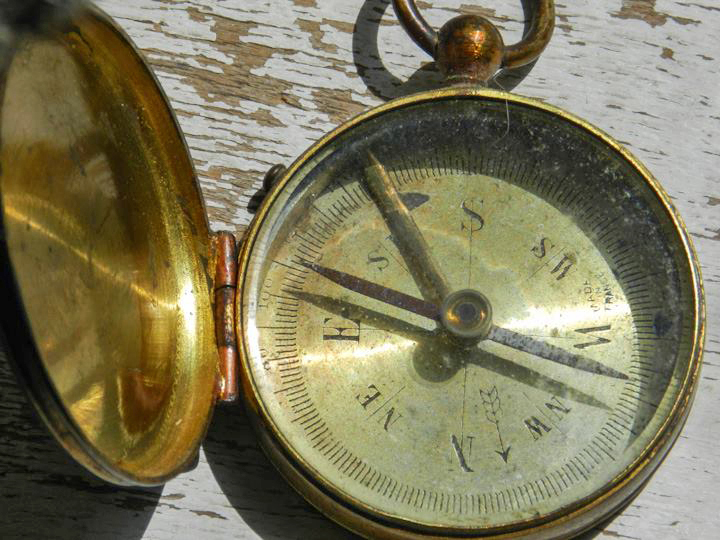 Chester’s pocket compass. Photo courtesy of Cynthia Lawry. C: There are so many stories to tell about this place. It’s very special. It used to be very good clamming, whether it is now or not I have no clue. At mid-tide we would row or take a little motorboat under the bridge and scream and yell. And you always have to honk when you go under the bridge on the road. I have a brother who teaches gun safety to the Massachusetts state police, and we were down here a couple of years ago to scatter my older brother’s ashes off of Egg Rock, and he turned his police sirens on going under the bridge! J: yeah, they’re sort of domesticated mountains. It’s a very domesticated wilderness. C: I have eaten periwinkles before. There was a guy who lived across the street from my great-grandparents, and he liked pickled periwinkles. So they would come down and collect periwinkles and his wife would pickle them. J: I’ve had pickled whelks, I haven’t had the periwinkles. They call them wrinkles, the pickled whelks. C: Really! I had never heard of that before. I thought it was the grossest thing on the planet. J: Oh, love them. But then I like kind of weird, chewy things. I’ll eat just about anything once. C: My mother growing up here ate so much lobster she would never eat it for the rest of her life. And mussels. People now eat mussels, it’s a delicacy, but at the time we wouldn’t have thought of eating a mussel. And pollock, pollock was bait fish. Now it’s good eating. It’s a sustainable kind of critter. J: Yeah, it’s funny, as we fish out the older species, we’re turning to new ones. C: We never came over [to this side] as kids. To go swimming. We’d bring a boat in here every once in a while. It was considered safe for us to row a boat up under there. One year we were pulling a boat and we were going to take it out to Seal Harbor, and that was when Rockefeller was vice-president, and he was in residence, and I was to drive the boat over and my father was going to meet me there with a truck and a trailer to pull it, and the Secret Service had the whole harbor blocked off. J: Plan B. What did you do? C: I was just a ten-year-old kid, I just turned around and came back. C: When I was a kid there were only three boats, maybe four boats, in the Creek. There were my uncle Harold, and my great-grandfather, and I don’t know who else had, I think there were sort of really part-timers that had some boats in there, but they were the only ones that had the fish house over here, the fish shack. 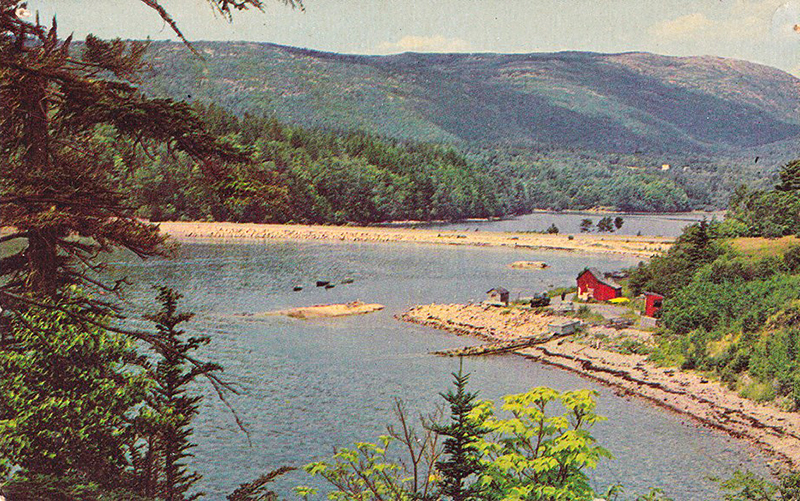 I have a color postcard from the forties and it shows their lobster boats. And a lot of other boats because that was before my time. C: My great-grandfather used to fillet out a halibut. It was amazing to watch. I wish I had paid more attention, because he could just pull the whole bone right out. It was crazy. J: That would be a useful skill. C: We caught a lot of dogfish when we were setting trawl. That was mostly what you caught. And we would sometimes bring them home. They were very good eating. J: Those are a kind of shark, aren’t they? C: Yeah, they’re a five to six foot long shark. They’re not very big. I remember him cleaning them and having me touch the spine, you touch the base of the spine or the head and the other end of the tail wiggles. Freaky things to children. The border of solid land between the mudflats and the hill narrowed quickly and pretty soon we had to choose between scrambling over algae-covered boulders, squishing through the mud, or climbing back up the hill to the road. You know what those damp, grey spring days are like – after talking for two hours we were thoroughly chilled. It was also noon, and all that talk about fried clams earlier had gotten us hungry for them, so we headed straight for the Thirsty Whale to warm up over a big basket of clams. Cynthia later emailed me photos from her collection, which you’ve seen scattered throughout this post and the last one. Thanks so much for making the trip, Cynthia! Jennifer…just coming across your work…totally enjoyable! Thanks Bob! Any chance of you joining me on a walk? I know you’ve got some great stories. This is such a fun interview! 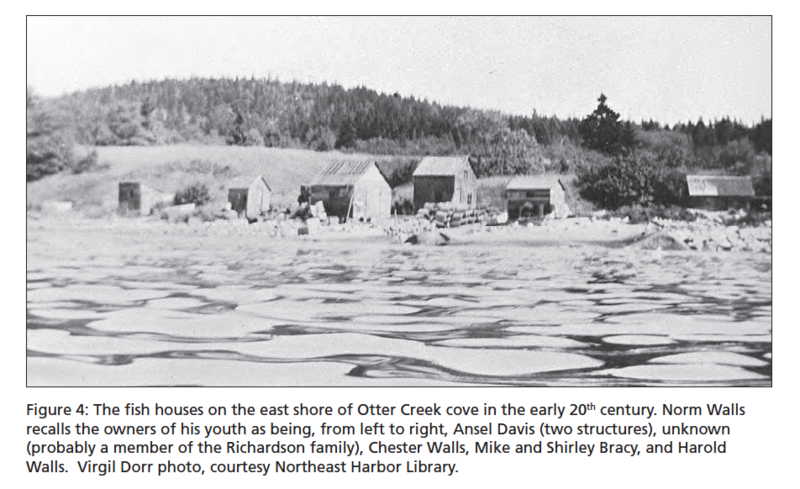 I have always wondered at the history of that little beach and the shack across the way. I loved to sit there and enjoy the stillness (and roses).